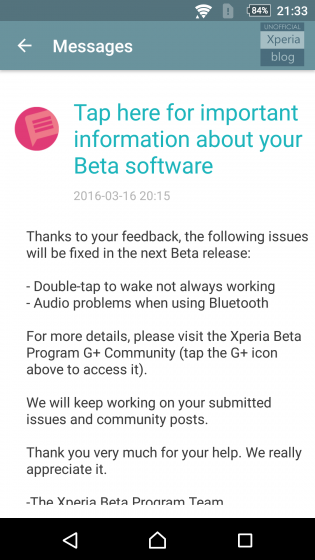 Sony is releasing an update to the Z2/Z3 beta that's been going out. This release is to address the double tap to wake which hasn't been working much for many. This isn't the only bug that's affecting the beta, we also have a nice crackling effect making the Bluetooth audio virtually unusable. Sony has been really good at producing quality software on their devices and I'm sure this will all get addressed properly in the coming bug fix update.